I'm not completely sure of what edition this is. The back of the box shows a 2006 copyright, and the rulebook says 2004-2009. On receiving this game from a previous MT, I noted that a few of the artillery minis had broken wheels; this is an aesthetic concern and in no way affects gameplay, but I mention it for the sake of completeness. Everything else is in great condition. 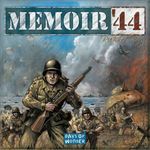 Sweetener:Memoir '44: Eastern Front - also received in a previous MT, but never played by me. The outer box sleeve and the corners of the box have a few dings, but everything is structurally sound. Components are complete and in great shape.